How Could a Mob Be Painted? In an 1834 congressional debate over appropriations for a new round of paintings in the U.S. Capitol rotunda, Federalist representative Tristam Burges made a suggestive aside that illuminates the deeply politicized character of painting in the Jacksonian era. Discussing potential subjects for the proposed paintings, the politician queried his colleagues: "How could a mob be painted?" Pausing briefly for effect, Burges declared, "In no way, but to place one upon a stump, making a speech," an answer that conflated the democratic practice of electioneering with political violence and discouraged artistic engagements with both subjects.1 As an observation made offhandedly by an avowed amateur in aesthetic matters, Burges's comment points to a set of ideas about the character and objectives of painting that had attained commonsensical status for many period Americans. Indeed, Burges's brief aside drew on a ubiquitous aesthetic discourse, which I will call "republican aesthetics," that nearly foreclosed the possibility of representing the raucous popular politics and violent upheaval of the Jacksonian era in paint. As this chapter will demonstrate, republican aesthetic theory construed fine art as a medium through which an ideal mode of hierarchical republicanism might be articulated, realized, and sustained in the face of growing disorder and accelerating democratization.2 Proponents of republican aesthetics conceived academic painting as a vehicle for the transmission of correct civic behaviors, an engine for the reproduction of customary hierarchies, a disciplinary vehicle that could restrain popular disorder, and an ideological instrument that could establish hierarchical republicanism as a commonsensical framework for everyday political thought. Pressured by these arguments, politically-inclined artists focused on the figures and spaces of genteel political rule and largely ignored those tumultuous phenomena that threatened the ideals of hierarchical republicanism. Two painters broke from this tendency, however, composing scenes of turbulent crowds that explored the disorderly energies of popular democracy and political violence. 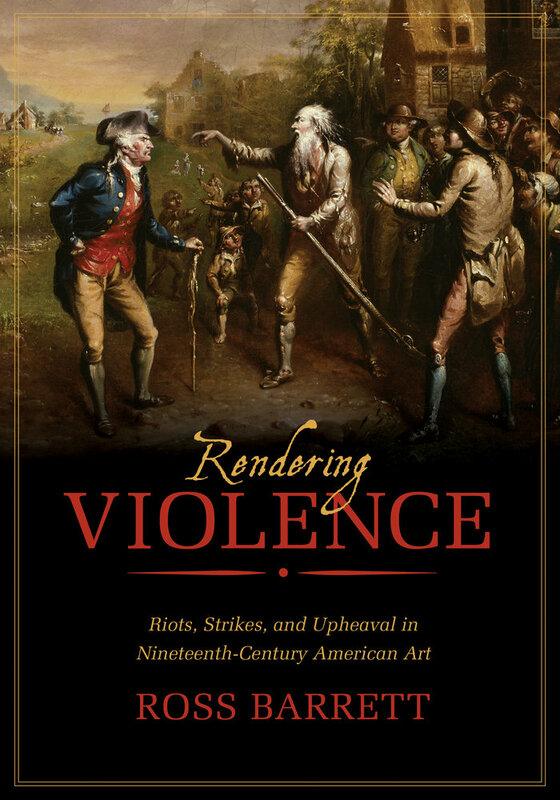 This chapter will examine these painterly projects-Thomas Cole's Destruction and John Quidor's Rip Van Winkle-as pioneering efforts to negotiate the pressures of republican aesthetics and tap the creative potential of disorder. As we will see, these paintings work in various ways to invoke and dramatize the intertwined phenomena of antebellum upheaval and popular street politics. In so doing, both Destruction and Rip Van Winkle also recode the apparition of Jacksonian disorder, employing a variety of cultural frameworks to mute the alarming implications of violence and democratic rowdiness. The resulting works expose contradictions of feeling that quietly unsettled arguments for orderly politics in the Jacksonian era and open on to alternative political cultures that emerged to contest the precepts of official republican discourse and aesthetic theory. On its surface a depiction of a military battle set in an imagined ancient past, Cole's Destruction shapes a vision of upheaval that subtly invokes the rioting that surrounded the artist in New York in the early 1830s. To explore this alarming subject and answer critical calls for stabilizing imagery, Cole drew on a rhetorical tradition that was attuned to the republican precepts undergirding early aesthetic theory. More specifically, Cole engaged the themes of the political jeremiad, a prophetic rhetorical mode wielded by conservative thinkers throughout the early nineteenth century to underscore the virtue of political harmony and hierarchy. In composing his own painterly jeremiad, Cole likewise strove to reaffirm the ideals of hierarchical republicanism, even as he worked to conjure up the dramatic energy of period upheaval. Inscribed with arresting formal contrasts and countless gory details, Destruction ultimately visualizes the quiet fascinations that Jacksonian tumult could hold for the era's most ardent champions of lawful order. If Cole's monumental scene amplifies the tropes of the conservative imaginary, John Quidor's Rip Van Winkle satirizes the arguments and anxieties of Federalist and Whig thinkers. In so doing, the picture focuses its humorous energies on a different manifestation of Jacksonian political tumult. Rip Van Winkle addresses the disorderly energies of mass democracy, focusing on a manifestation of Jacksonian street politics that period conservatives associated with anarchic chaos: the raucous electoral crowd. Appropriating Washington Irving's 1819 short story "Rip Van Winkle" as a symbolic frame, the 1829 picture organizes a mediated scene of the partisan crowd that spoofs conservative fears about democracy's violent potential. Quidor, I will argue, focused on a moment in the story in which these political implications are most strikingly manifest-the moment at which Rip confusedly confronts a democratic mob in his former hometown-and comically hyperbolized them, creating a ridiculous scene of electoral turbulence that mocks antidemocratic hysteria and quietly lampoons the politicized principles of republican aesthetics. Answering the sober tenets of official political and aesthetic belief with a vision of wild hyperbole, Quidor's rendering of Jacksonian rowdiness contributed to the new mode of raucous democratic humor that emerged in the 1820s to contest high-toned political commentary. Early nineteenth-century critics regularly stressed the power of fine painting to sustain the fledgling republican polity by communicating its central ideals, making its structures visible and "real" to period viewers, and establishing republicanism as the ultimate horizon of political possibility for the new nation. Articulated by a variety of cultural commentators, these arguments gradually cohered into a consistent theoretical discourse that would profoundly influence the production and consumption of political art in the Jacksonian period and deeply complicate the painterly representation of popular democracy and violent unrest. Voiced initially in academic halls and genteel cultural journals, republican aesthetic arguments eventually found expression in a wide range of venues. An apocryphal news story that appeared in the New York American in the wake of an 1834 antiabolitionist riot in that city provides a dramatic illustration of this currency: "The infuriated mob, during their attack upon Mr. Tappan's house on Wednesday night, were for a moment arrested in their work of destruction upon the furniture by the discovery, that they were about committing to the flames the 'likeness of Washington.' A general cry was sent forth-'it is Washington-in the name of God don't burn Washington.' The painting was thereupon born off in triumph by the populace, and safely deposited in a neighboring house. "10 This brief anecdote expands suggestively on period arguments about the edificatory and disciplinary power of painting. Upon its discovery, a painting of George Washington, the ultimate embodiment of political virtue, instantly produces an orderly body politic, "arresting" the flow of violence and transforming the "infuriated mob" into a self-disciplined "populace." Widely republished in East Coast newspapers, this brief story dramatized the capacity of painting to channel the turbulent energies of street politics into peaceable expressions of patriotic loyalty and civic commitment, appropriating and dramatizing the themes of sophisticated aesthetic discourse for a popular readership. Even as they sought to define the ordering and harmonizing effects of academic art, early arts advocates identified subjects most amenable to hierarchical republicanism. Almost invariably, they urged artists to concentrate on the political elite. An 1816 North American Review article, for example, argued that academic art devoted to "the actions of our great and good men" would "prompt . . . citizens to illustrious deeds of heroism or benevolence. "11 In a contemporaneous speech DeWitt Clinton called for the establishment of a gallery of "illustrious men" in New York, which might inspire visitors "to rouse the soul of generous emulation, and to catch the spirit of heroic virtue. "12 While identifying the noble few as subjects ideally suited to the communication of republican values, these accounts theorized a mode of art spectatorship that would reinforce established hierarchies. Looking at an image of "illustrious men," the viewer would be "prompted" to apprehend the "great and good" as a perfect embodiment of republican precepts and to strive to "emulate" that archetype-an adulatory and deferential experience that reaffirmed the authority of the elite leader and the viewer's subordinate status. Ross Barrett is Assistant Professor of Art History at the University of South Carolina. He has published articles in The Art Bulletin, American Art, and Winterthur Portfolio, along with catalog essays and entries on American painting and vernacular photography. He is also coeditor, with Daniel Worden, of Oil Culture, a volume of essays that examines cultural representations of petroleum and the oil industry.